Orthopedic Oncology Services, Department of Surgical Oncology, Tata Memorial Hospital, Mumbai. Associate Professor, Orthopedic oncology, Department of Surgical Oncology, Tata Memorial Hospital, Mumbai. Introduction: Persistent rotatory instability is often described in association with ACL reconstruction. Recent studies have drawn attention to the lateral sided knee structures as possible contributors to this instability. However, varying terminology and research methodology has made the results of these recent studies difficult to interpret. It is crucial that surgeons have a thorough understanding of anterolateral knee anatomy and function prior to proposing extra-articular treatment options. The most important factor in restoring rotatory knee stability is to perform an individualized, anatomic ACL reconstruction that recreates the native anatomy of the torn ACL. This will restore native knee stability in the vast majority of cases. However, a subset of patients will have some degree of anterolateral knee injury that may need to be addressed. At this time, the proper indications for surgery and the best extra-articular procedure are not known. Therefore, it is paramount that future research establishes consistent terminology and research methodology so that scientific understanding of this incredibly intricate anatomic complex can progress. Key Words: Anterior cruciate ligament, reconstruction, Anterolateral Complex of the Knee. Despite multiple technological advances in the surgical technique, graft options, and postoperative rehabilitation of anterior cruciate ligament (ACL) reconstruction, some patients continue to have persistent rotatory instability [1-3]. The reasons for this rotatory instability are multifactorial, and contributing factors can include untreated meniscal tears, under-appreciated menisco-capsular separations, bony morphologic characteristics, poor tunnel positioning, improper graft choice, technical mistakes during ACL reconstruction, generalized ligamentous laxity, and injuries to the anterolateral side of the knee [4-8]. Recent studies have suggested that the anterolateral knee structures may play an important role in the rotatory stability of the knee [1, 9, 10]. In fact, some studies have reported the discovery of a new ligament, termed the anterolateral ligament (ALL) [11-13]. Other studies have suggested anterolateral rotatory instability is a function of multiple anterolateral knee structures, termed the anterolateral complex (ALC), as opposed to a single ligamentous structure [14, 15]. In fact, anterolateral rotatory instability and the anterolateral knee structures have become quite a controversial topic. Inconsistent terminology, varying definitions of the origin and insertion of the ALL, differing specimen preparation methods and dissection methods, the complexity of the lateral sided knee anatomy, and variable interpretation of imaging findings have all contributed to the confusion surrounding the anterolateral knee structures. Consistent terminology and reporting will be crucial to advancing the knowledge and understanding of the anterolateral knee structures in the future. Contrary to popular belief, investigations and descriptions of the anterolateral knee structures are not a recent phenomenon. Several authors described a mid-third capsular thickening in the 1980s [16-20]. Furthermore, it appears that many modern descriptions of the ALL are likely referring to either the capsulo-osseous layer of the iliotibial band (ITB)[12, 21, 22], the mid-third capsular ligament[23-26], or both. It is often difficult to compare between studies as findings from dissections performed using embalmed specimens seem to differ from those using fresh-frozen specimens. The anatomy of the anterolateral knee is quite complex. However, the function of these structures becomes more obvious with greater understanding of the native anatomy. The anterolateral knee can be divided into three general layers and four main structure groups (superficial ITB, deep ITB, capsulo-osseous layer of the ITB, and the anterolateral capsule). The superficial ITB is located in Layer 1. It inserts distally on Gerdy’s tubercle and just posterior to Gerdy’s tubercle. It contains fibers running to the lateral aspect of the patellar and patellar tendon, known as the iliopatellar band (Figure 1). Posteriorly, the superficial ITB connects with the fascia of the biceps femoris. It attaches to the lateral intermuscular septum as well . Layer 2 consists of the posterior aspect of the superficial ITB as well as the deep ITB. This layer attaches to the lateral femoral epicondyle and inserts just posterior to Gerdy´s tubercle. Proximally, the Kaplan fibers are part of this layer (Figure 2) . These fibers connect the superficial ITB with the distal femoral metaphysis and condyle. They also run near the superior genicular artery and its branches . The capsulo-osseous layer of the ITB is continuous with the lateral gastrocnemius muscle fascia. The capsulo-osseous layer merges with the rest of the ITB distally. It then inserts on an area halfway between the posterior aspect of the fibular head and the tip of Gerdy´s tubercle, termed the mid-lateral tibial tubercle. Finally, Layer 3 contains the anterolateral capsule. The capsule consists of a superficial and deep layer, both of which merge into one layer more anteriorly. The deep layer passes deep to the LCL and the superficial layer passes over it superficially. It is thought that the thickening at the confluence of the two layers may be the mid third capsular ligament as described by Hughston et al. [18, 19] to be present in 35% of dissected specimens. Regarding the presence of a discrete identifiable ALL, study results have varied widely. Some studies report that there is an ALL present in nearly 100% of the specimens, while others have found it to be present in a third of specimens. [12, 13, 15, 23, 24, 30] One study examined pediatric cadaver knees reported that the ALL was present in 12.5% of the specimens. Some studies may have enhanced the presence of the ligament by positioning the knee structures such that the capsule was tensioned in the shape of a ligament, and then by removing the surrounding tissue. [32, 33] The anatomic location of the proposed ALL differs among studies as well. Some studies list the femoral origin posterior to the lateral collateral ligament (LCL),[24, 33] some describe it near the LCL origin,[23, 24] and some describe it as originating anterior and/or distal to the LCL origin. [13, 23, 32, 34] Descriptions of the distal insertion likewise vary. While most studies have reported the distal insertion to be located mid-way between Gerdy’s tubercle and the fibular head,[13, 23, 24, 34] others have described it as being located slightly more anterior. [11, 25] Further disagreements include the relationship of the ALL with the capsule, the meniscus, and the overall orientation of the ALL fibers. [11-15, 22, 24-26, 32-36] Regardless, it is obvious that the lack of standardization in anatomical descriptions as well as varying specimen fixation methods, dissection methods, and cadaver ages has led to discrepant descriptions and findings regarding the presence and anatomy of the anterolateral structures. As such, it is recommended that the anterolateral knee structures consisting of the superficial and deep ITB (along with the Kaplan fibers and capsulo-osseous layer) and the anterolateral capsule be referred to as the anterolateral complex (ALC). Numerous studies have investigated the biomechanics of anterolateral knee structures. While many of these studies have investigated the relationship between the ALL and rotatory instability, results have been inconsistent. Furthermore, the actual structures considered as the ALL differ and this heterogeneity has made it difficult to interpret the findings [26, 37-42]. Although the ITB is known to confer significant rotatory stability to the knee many of the studies have investigated the ALL with the IT band sectioned. On the other hand, when injury to the ALL were investigated with preserved ITB function, no increase in rotatory instability was observed. Of the studies that did report greater rotatory knee instability with sectioning of the ALL, many were performed at high flexion angles which are not representative of knee position during typical ACL injury [39, 40, 44]. Importantly, the ITB has been found to be the most robust contributor to anterolateral knee stability through all angles of knee flexion. The part of the superficial and deep ITB that is located between the Kaplan fibers proximally, and the insertion at the proximal tibia distally, form a discreet functional unit which contributes greatly to knee stability. [17, 20] In fact, tightening of this structure has been reported with knee flexion, as well as an increase in length. [17, 20] Robotic studies have shown that this portion of the ITB is responsible for 70% of the restraint to internal rotation restraint in ACL intact and deficient knees . Some studies have reported that suggested injuries to the anterolateral capsular structures are associated with greater rotatory instability. [9, 45] In fact, increased lateral compartment translation during pivot shift (utilizing quantitative pivot shift testing) was associated with MRI-visible anterolateral capsule injury. When interpreting these results, it should be noted that identification of individual anterolateral structures can be difficult via MRI, and the ALC should be considered as a whole when evaluating for injury when using this imaging modality. Various procedures have been proposed to address anterolateral complex injuries. However, it should be noted that an anatomic ACL reconstruction, individualized for each patient, is the most important step in restoring rotatory knee stability in this patient population. In addition, other injuries such as meniscal tears, should be treated properly to help restore stability. In fact, it is not currently known which patients may benefit from extra-articular anterolateral procedures. One study reported good outcomes after a combined “anatomic ALL” reconstruction combined with ACL reconstruction. Interestingly, there was no control group to compare to, and follow-up time was less than ideal. Further biomechanical studies have suggested that extra-articular procedures may play a role in patients with ALC/ALL injuries. However, extra-articular procedures carry inherent risks, including over-constraint of the lateral compartment, ultimately leading to arthritis, and wound problems. Interestingly, many of these procedures recommend the use of the ITB as an extra-articular graft. It should be noted that the ITB utilized as graft has been shown to be stiffer than many of the anterolateral structures, and may contribute to the over-constraint often described with these procedures. Furthermore, removal of a portion of the ITB to utilize in its non-native position may lead to worsening anterolateral instability. In addition, it is not known if anterolateral knee injuries will heal on their own. As such, surgeons should use caution before performing additional extra-articular procedures for anterolateral complex injuries in the setting of ACL reconstruction. Persistent rotatory instability is a well-known finding associated with ACL reconstruction. While proper reconstruction of the ACL is requisite to achieving optimal outcomes, concomitant injuries must be considered, especially in the setting of significant rotatory instability. The anterolateral structures play an important role in this stability, and should be assessed for injury. However, the indications for extra-articular tenodeses and reconstructions are currently unknown. Unindicated anterolateral knee procedures can be associated with significant negative outcomes, and their use must be carefully considered. Future studies on anterolateral knee should use consistent terminology and sound research methodology. In fact, it is recommended to refer to the anterolateral knee structures as the anterolateral complex (ALC) to properly refer to numerous structures which make up a synergistic functional unit. 1. Tanaka M, Vyas D, Moloney G, Bedi A, Pearle AD, Musahl V. What does it take to have a high-grade pivot shift? Knee Surg Sports Traumatol Arthrosc. 2012 Apr;20(4):737-42. 2. Zantop T, Schumacher T, Diermann N, Schanz S, Raschke MJ, Petersen W. Anterolateral rotational knee instability: role of posterolateral structures. Winner of the AGA-DonJoy Award 2006. Arch Orthop Trauma Surg. 2007 Nov;127(9):743-52. 3. Jonsson, H., K. Riklund-Ahlstrom, and J. Lind. Positive pivot shift after ACL reconstruction predicts later osteoarthrosis: 63 patients followed 5-9 years after surgery. Acta Orthop Scand, 2004. 75(5): p. 594-9. 4. Spragg L, Chen J, Mirzayan R, Love R, Maletis G. The Effect of Autologous Hamstring Graft Diameter on the Likelihood for Revision of Anterior Cruciate Ligament Reconstruction. Am J Sports Med. 2016 Jun;44(6):1475-81. 5. Maletis GB, Inacio MC, Funahashi TT. Risk factors associated with revision and contralateral anterior cruciate ligament reconstructions in the Kaiser Permanente ACLR registry. Am J Sports Med. 2015 Mar;43(3):641-7. 6. Görmeli CA, Görmeli G, Öztürk BY, Özdemir Z, Kahraman AS, Yıldırım O, Gözükarab H. The effect of the intercondylar notch width index on anterior cruciate ligament injuries: a study on groups with unilateral and bilateral ACL injury. Acta Orthop Belg. 2015 Jun;81(2):240-4. 7. Leroux T, Wasserstein D, Dwyer T, Ogilvie-Harris DJ, Marks PH, Bach BR Jr, Townley JB, Mahomed N, Chahal J. The epidemiology of revision anterior cruciate ligament reconstruction in Ontario, Canada. Am J Sports Med. 2014 Nov;42(11):2666-72..
8. Hofbauer M, Muller B, Murawski CD, van Eck CF, Fu FH. The concept of individualized anatomic anterior cruciate ligament (ACL) reconstruction. Knee Surg Sports Traumatol Arthrosc. 2014 May;22(5):979-86. 10. Arilla F, Guenther D, Yacuzzi C, Rahnemai-Azar A, Fu F, Debski R, et al. Effects of anterolateral capsular injury and extra-articular tenodesis on knee kinematics during physical examination. American Orthopaedic Society for Sports Medicine. Orlando: Orthopaedic Journal of Sports Medicine; 2015. p. 2325967115S00032. 11. Helito CP, Demange MK, Bonadio MB, Tirico LE, Gobbi RG, Pecora JR, Camanho GL. Radiographic landmarks for locating the femoral origin and tibial insertion of the knee anterolateral ligament. Am J Sports Med. 2014 Oct;42(10):2356-62. 12. Dodds AL, Halewood C, Gupte CM, Williams A, Amis AA. The anterolateral ligament: Anatomy, length changes and association with the Segond fracture. Bone Joint J. 2014 Mar;96-B(3):325-31..
13. Claes S, Vereecke E, Maes M, Victor J, Verdonk P, Bellemans J. Anatomy of the anterolateral ligament of the knee. J Anat. 2013 Oct;223(4):321-8. 14. Guenther D, Rahnemai‐Azar AA, Bell KM, Irarrazaval S, Fu FH, Musahl V, Debski RE. The Anterolateral Capsule of the Knee Behaves Like a Sheet of Fibrous Tissue, in American Academy of Orthopaedic Surgeons. 2016: New Orleans, FL, USA. 15. Rahnemai-Azar AA, Miller RM, Guenther D, Fu FH, Lesniak BP, Musahl V, Debski RE. Structural Properties of the Anterolateral Capsule and Iliotibial Band of the Knee. Am J Sports Med. 2016 Apr;44(4):892-7. 16. Terry GC, Hughston JC, Norwood LA. The anatomy of the iliopatellar band and iliotibial tract. Am J Sports Med. 1986 Jan-Feb;14(1):39-45..
17. Lobenhoffer P, Posel P, Witt S, Piehler J, Wirth CJ. Distal femoral fixation of the iliotibial tract. Arch Orthop Trauma Surg. 1987;106(5):285-90..
18. Hughston JC, Andrews JR, Cross MJ, Moschi A. Classification of knee ligament instabilities. Part I. The medial compartment and cruciate ligaments. J Bone Joint Surg Am. 1976 Mar;58(2):159-72. 19. Hughston JC, Andrews JR, Cross MJ, Moschi A. Classification of knee ligament instabilities. Part II. The lateral compartment. J Bone Joint Surg Am. 1976 Mar;58(2):173-9..
20. Hassler H, Jakob RP. [On the cause of the anterolateral instability of the knee joint. A study on 20 cadaver knee joints with special regard to the tractus iliotibialis (author’s transl)]. Arch Orthop Trauma Surg, 1981. 98(1): p. 45-50. 21. Vieira EL, Vieira EA, da Silva RT, Berlfein PA, Abdalla RJ, Cohen M. An anatomic study of the iliotibial tract. Arthroscopy. 2007 Mar;23(3):269-74. 22. Daggett M, Ockuly AC, Cullen M, Busch K, Lutz C, Imbert P, Sonnery-Cottet B. Femoral Origin of the Anterolateral Ligament: An Anatomic Analysis. Arthroscopy. 2016 May;32(5):835-41. 23. Stijak L, Bumbaširević M, Radonjić V, Kadija M, Puškaš L, Milovanović D, Filipović B. Anatomic description of the anterolateral ligament of the knee. Knee Surg Sports Traumatol Arthrosc. 2016 Jul;24(7):2083-8..
24. Runer A, Birkmaier S, Pamminger M, Reider S, Herbst E, Künzel KH, Brenner E, Fink C. The anterolateral ligament of the knee: A dissection study. Knee. 2016 Jan;23(1):8-12. 25 Vincent JP, Magnussen RA, Gezmez F, Uguen A, Jacobi M, Weppe F, Al-Saati MF, Lustig S, Demey G, Servien E, Neyret P. The anterolateral ligament of the human knee: an anatomic and histologic study. Knee Surg Sports Traumatol Arthrosc. 2012 Jan;20(1):147-52..
26. Kennedy MI, Claes S, Fuso FA, Williams BT, Goldsmith MT, Turnbull TL, Wijdicks CA, LaPrade RF. The Anterolateral Ligament: An Anatomic, Radiographic, and Biomechanical Analysis. Am J Sports Med. 2015 Jul;43(7):1606-15. 27. Seebacher JR, Inglis AE, Marshall JL, Warren RF. The structure of the posterolateral aspect of the knee. J Bone Joint Surg Am. 1982 Apr;64(4):536-41. 28. KAPLAN EB. The iliotibial tract; clinical and morphological significance. J Bone Joint Surg Am. 1958 Jul;40-A(4):817-32..
29. Musahl V, Rahnemai-Azar AA, van Eck CF, Guenther D, Fu FH. Anterolateral ligament of the knee, fact or fiction? Knee Surg Sports Traumatol Arthrosc. 2016 Jan;24(1):2-3..
30. Dombrowski ME, Costello JM, Ohashi B, Murawski CD, Rothrauff BB, Arilla FV, Friel NA, Fu FH, Debski RE, Musahl V. Macroscopic anatomical, histological and magnetic resonance imaging correlation of the lateral capsule of the knee. Knee Surg Sports Traumatol Arthrosc. 2016 Sep;24(9):2854-60. 31. Shea KG, Polousky JD, Jacobs JC Jr, Yen YM, Ganley TJ. The Anterolateral Ligament of the Knee: An Inconsistent Finding in Pediatric Cadaveric Specimens. J Pediatr Orthop. 2016 Jul-Aug;36(5):e51-4. 32. Caterine S, Litchfield R, Johnson M, Chronik B, Getgood A. A cadaveric study of the anterolateral ligament: re-introducing the lateral capsular ligament. Knee Surg Sports Traumatol Arthrosc. 2015 Nov;23(11):3186-95..
33. Kosy JD, Soni A, Venkatesh R, Mandalia VI. 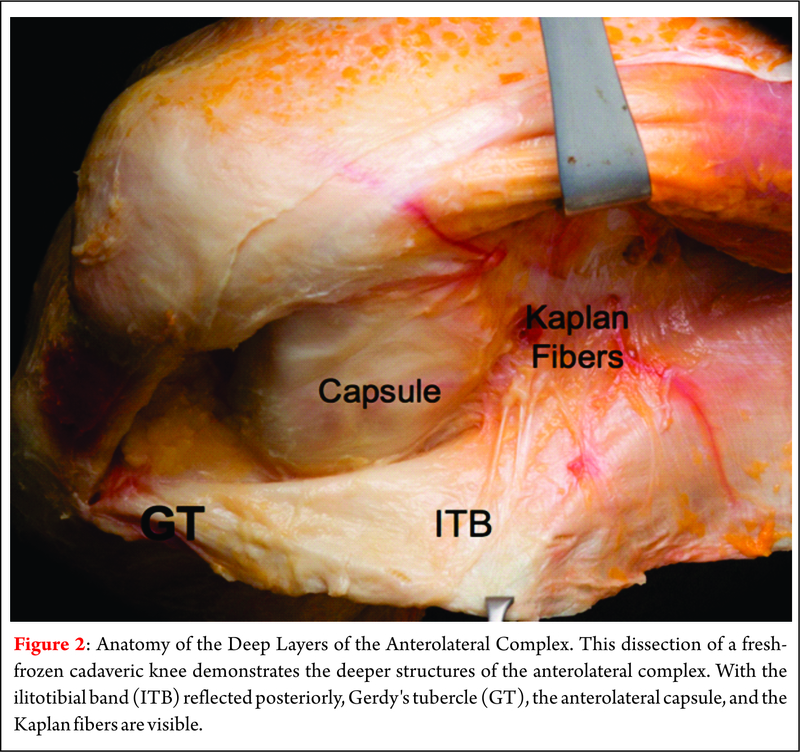 The anterolateral ligament of the knee: unwrapping the enigma. Anatomical study and comparison to previous reports. J Orthop Traumatol. 2016 Dec;17(4):303-308. 34. Helito CP, Demange MK, Bonadio MB, Tirico LEP, Gobbi RG, Pecora JR, Camanho GL. Anatomy and Histology of the Knee Anterolateral Ligament. Orthop J Sports Med, 2013. 1(7): p. 2325967113513546. 35. Daggett M, Claes S, Helito CP, Imbert P, Monaco E, Lutz C, Sonnery-Cottet B. The Role of the Anterolateral Structures and the ACL in Controlling Laxity of the Intact and ACL-Deficient Knee: Letter to the Editor. Am J Sports Med. 2016 Apr;44(4):NP14-5. 36. Kittl C, El-Daou H, Athwal KK, Gupte CM, Weiler A, Williams A, Amis AA. The Role of the Anterolateral Structures and the ACL in Controlling Laxity of the Intact and ACL-Deficient Knee. Am J Sports Med. 2016 Feb;44(2):345-54. 37. Thein R, Boorman-Padgett J, Stone K, Wickiewicz TL, Imhauser CW, Pearle AD. Biomechanical Assessment of the Anterolateral Ligament of the Knee: A Secondary Restraint in Simulated Tests of the Pivot Shift and of Anterior Stability. J Bone Joint Surg Am. 2016 Jun 1;98(11):937-43. 38. Slette EL, Mikula JD, Schon JM, Marchetti DC, Kheir MM, Turnbull TL, LaPrade RF. Biomechanical Results of Lateral Extra-articular Tenodesis Procedures of the Knee: A Systematic Review. Arthroscopy. 2016 Jun 18. pii: S0749-8063(16)30236-5. 39. Spencer L, Burkhart TA, Tran MN, Rezansoff AJ, Deo S, Caterine S, Getgood AM. Biomechanical analysis of simulated clinical testing and reconstruction of the anterolateral ligament of the knee. Am J Sports Med. 2015 Sep;43(9):2189-97. 40. Parsons EM, Gee AO, Spiekerman C, Cavanagh PR. The biomechanical function of the anterolateral ligament of the knee. Am J Sports Med. 2015 Mar;43(3):669-74..
41. Yamamoto Y, Hsu WH, Fisk JA, Van Scyoc AH, Miura K, Woo SL. Effect of the iliotibial band on knee biomechanics during a simulated pivot shift test. J Orthop Res. 2006 May;24(5):967-73..
42. Papageorgiou CD, Gil JE, Kanamori A, Fu FH. The biomechanical interdependence between the anterior cruciate ligament replacement graft and the medial meniscus. Am J Sports Med, 2001. 29(2): p. 226-31. 44. Rasmussen MT, Nitri M, Williams BT, Moulton SG, Cruz RS, Dornan GJ, Goldsmith MT, LaPrade RF. An In Vitro Robotic Assessment of the Anterolateral Ligament, Part 1: Secondary Role of the Anterolateral Ligament in the Setting of an Anterior Cruciate Ligament Injury. Am J Sports Med. 2016 Mar;44(3):585-92..
45. Song GY, Zhang H, Wang QQ, Zhang J, Li Y, Feng H. Risk Factors Associated With Grade 3 Pivot Shift After Acute Anterior Cruciate Ligament Injuries. Am J Sports Med. 2016 Feb;44(2):362-9..
46. Sonnery-Cottet B, Thaunat M, Freychet B, Pupim BH, Murphy CG, Claes S. Outcome of a Combined Anterior Cruciate Ligament and Anterolateral Ligament Reconstruction Technique With a Minimum 2-Year Follow-up. Am J Sports Med. 2015 Jul;43(7):1598-605. How to Cite this article: Burnham JM, Herbst E, Albers M, Pauyo T, Fu FH. 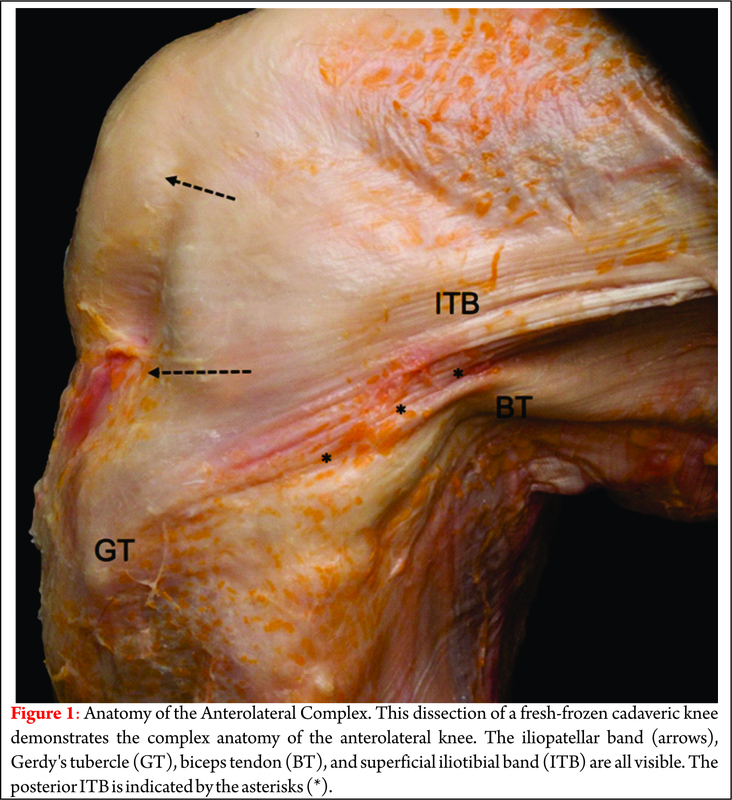 The Anterolateral Complex of the Knee: A Comprehensive Review of Its Structure and Function. Journal of Clinical Orthopaedics July – Dec 2016; 1(1):5-9.